I love this transformation and I still can’t believe this is where I get ready every morning. 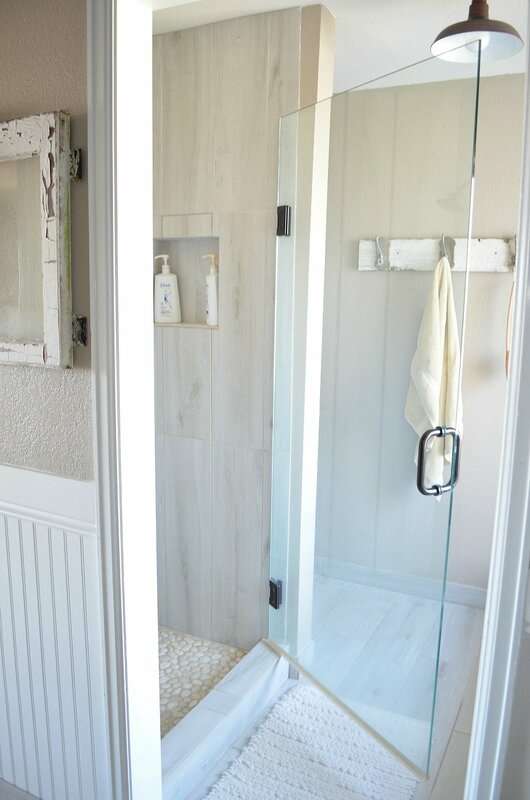 Bringing my vision to life for a modern farmhouse bathroom took us six looooooong months. It was the biggest project we’ve ever take on, but it was so worth it in the end. Overall I’m really happy with the decisions we made in this space. But today I want to talk about a few common questions I get a lot and share how things are doing one year later. How is the chalk paint holding up? The honest answer? Not great. We chose to use vintage dressers as vanities and I’m still so, so happy we went that route. 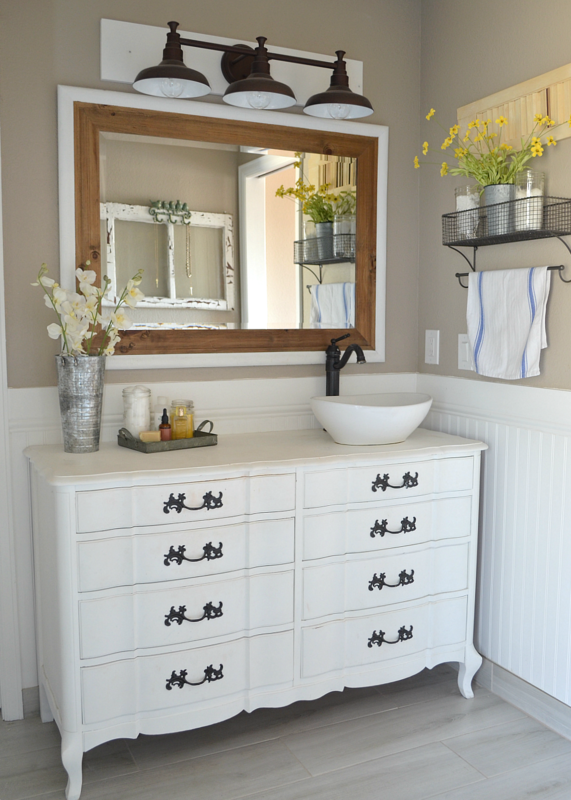 (You can see how we converted these into working vanities in this post.) 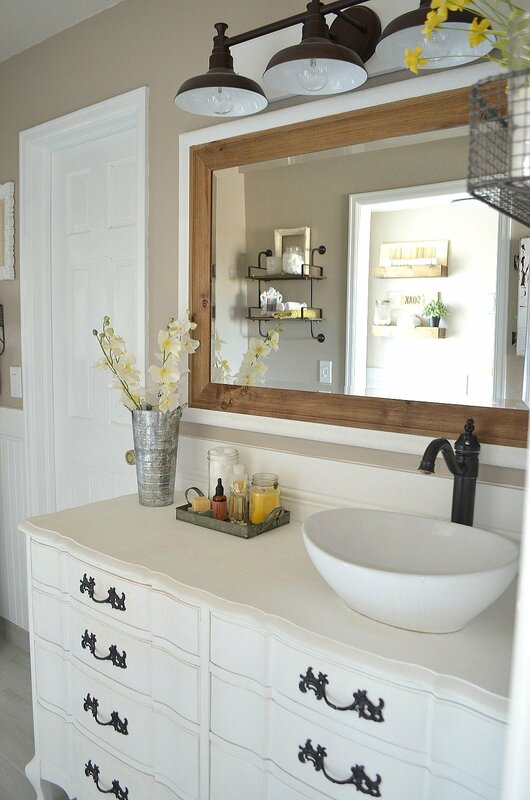 Not only was this way cheaper than a traditional vanity, but it adds so much charm and character to the bathroom. 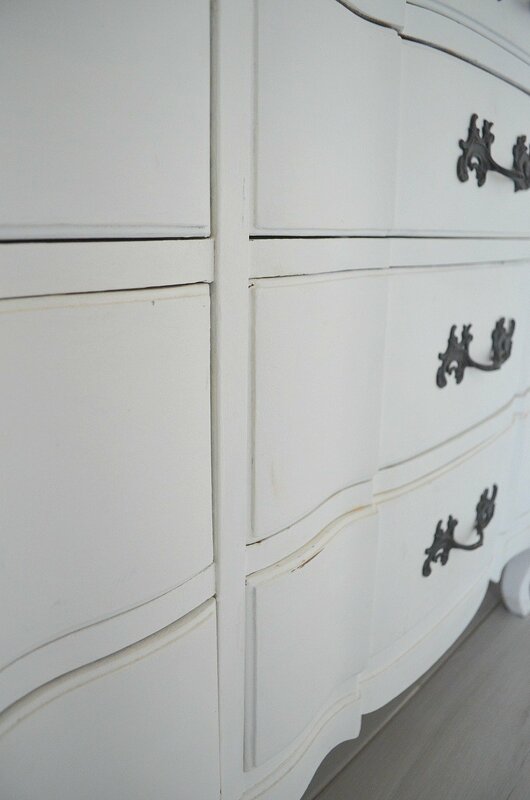 I made the decision to chalk paint these dressers, I used Annie Sloan Pure White, instead of using regular paint. I followed it up with Annie Sloan clear wax and it looked great. For about a month anyway. Then I started noticing little chips and signs of wear all over the drawers of my vanity, after only a month or so of use. My initial thought was that I hadn’t used enough wax to seal it, so I sanded down the bad spots and did the whole painting and waxing combo again. This time using two coats of wax. Again, this same thing started happening about a month later. More chipping and scuffed up paint. Every few months I have to re-paint and re-wax this area of my vanity and it’s a total pain. Now let me clarify something–on just about any other piece of furniture in our home I wouldn’t care about a little distressing. Heck, I usually LOVE a worn look. But for these vanities I wanted them to be super polished. Very clean and crisp looking. No distressing at all. 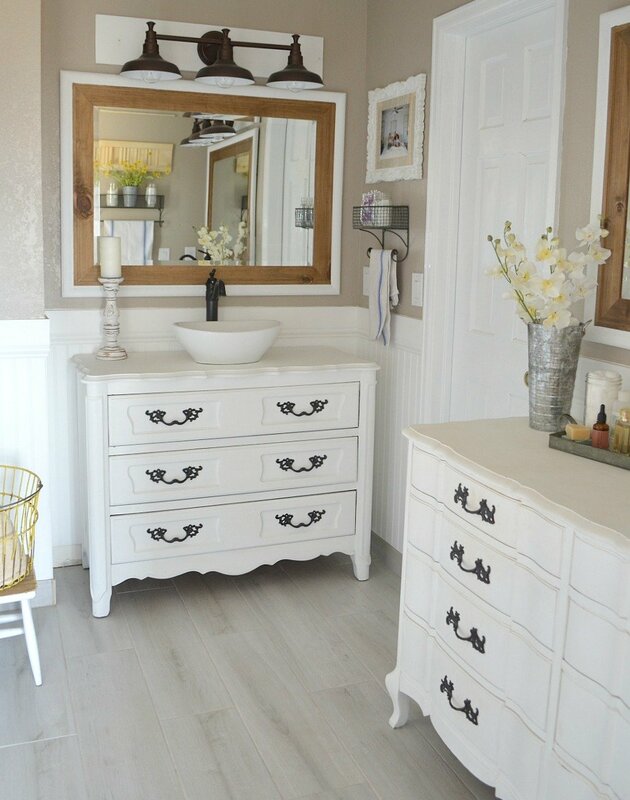 I thought I could accomplish that look with chalk paint and wax, but given my experience with these vanities I don’t think it’s possible. I’ve also been really disappointed with how this has held up around the faucet, where it’s exposed to water on a daily basis. 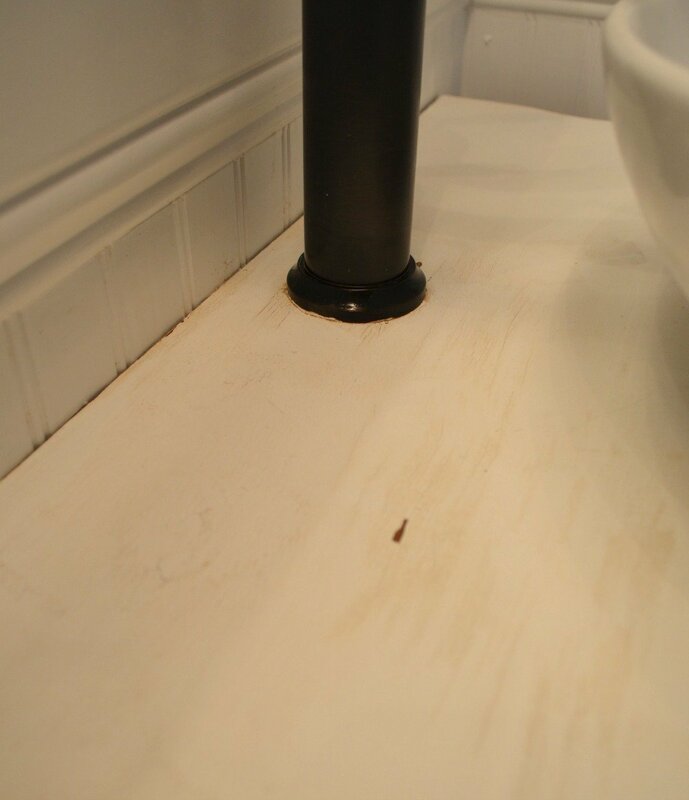 If you look closely you can see water damage starting to form along the top of the vanity, as well as around the faucet itself. This is happening even with me frantically wiping down the vanity every time it gets wet. After only 1 year of use, I’m not thrilled with how this looks or how it’s holding up. How does it clean up? I find it really difficult to keep these vanities looking clean and white. The chalk paint just doesn’t clean up well, it seems everything leaves a stain or dark mark–including makeup, which is definitely a problem since I use makeup here almost every day and it inevitably gets on the dresser. This issue could be partially due to the fact that I used white chalk paint, but I’m not sure. I just feel like it always looks dirty, which drive me crazy. How is storage in the dressers? Storage is awesome, I haven’t had any issues in the past year. We did lose a few drawers in each dresser due to the plumbing, but that really hasn’t been a problem. 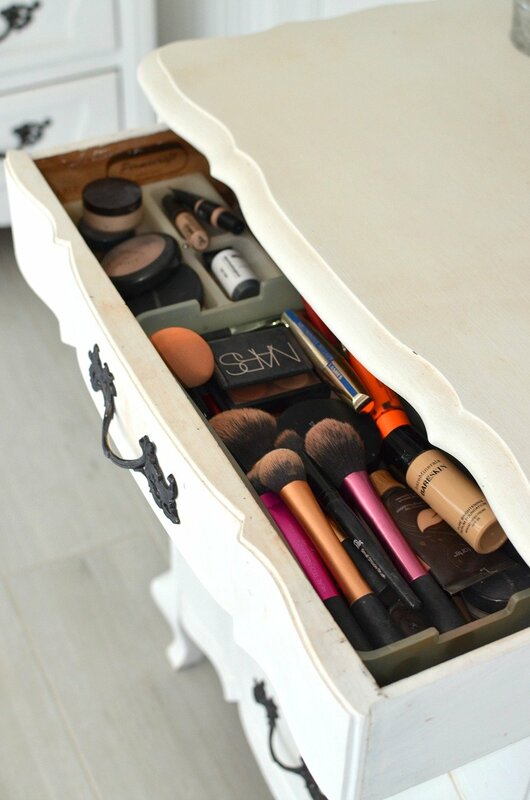 I have plenty of space for all my makeup, hair tools, and extra stuff you keep in any bathroom vanity. I also love the way we offset the sink over to the right on my dresser, the larger one, leaving plenty of space for my hair and makeup goodies. Overall I’m still really happy I decided to use old dressers in this bathroom, but I should not have used chalk paint. I probably should have went with an oil based paint instead, which would clean up easily and be very durable. Had I taken the time to do that instead of chalk paint, I don’t think I would be encountering so many issues with the paint chipping, cracking, and showing water damage. Additionally, I should have used a clear polycrylic to protect the top of the dressers instead of using wax. I actually did this on our dining table and the combination worked perfectly–no water damage at all on that table. I’ll likely be sanding these dressers and redoing the whole thing soon. And there I am, in my natural habitat: messy bun, no makeup, camera in hand. Still absolutely loving these floating shelves and the farmhouse curtains I made, they’re all holding up really well. Although it looks like I need to buy more soap. I’m still so happy with the colors we chose for the tile. I was afraid it would be too much grey, but I think it all works together really well. 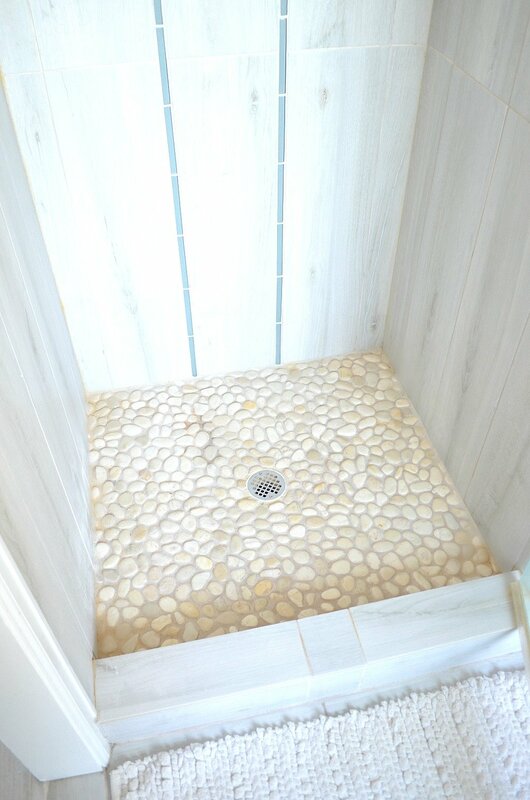 And I really love those little white pebbles there in the shower pan, they’re one of my favorite things in the entire bathroom. Sometimes I do wish we could have found a way to make this shower space larger, but it’s still so much better than what we had before. That shower was like a dark, scary cave. I have to say I do love chalk paint and I always will. However, I think there’s a time and place for it. And a bathroom vanity is probably not the best place. If you’re painting furniture and looking for a really polished, clean look I would definitely recommend going with either latex or oil based paint. Given my experience with these vanities over the past year, I just don’t think chalk paint can give you that look. Please keep in mind these are just my opinions, I’m not trying to bash my beloved chalk paint, but I do want to share my honest opinion based on my experience. And despite the mistake I made with my paint choice, I obviously still LOVE this bathroom remodel. The whole project still feels like a dream come true. 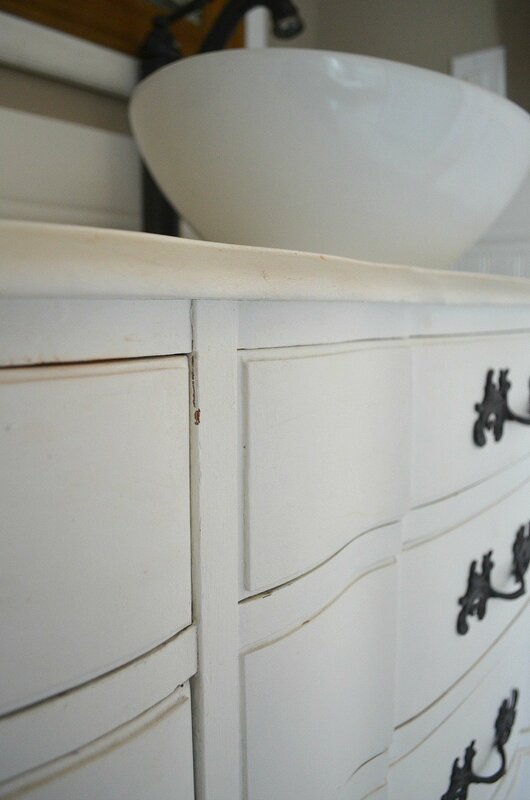 **UPDATE: Check out this post to see how I repainted these vanities! Tile Color/Brand: All tile was purchased from The Tile Shop in Denver. The blue accent tile in the shower is Water Glass Brule Mosaic Tile. The tile around the tub is Lanshai. Thank you all so much for stopping by the blog today! I’d love to chat if you have any questions or comments, so don’t be shy. Also be sure to track me down over on Facebook, Pinterest, and Instagram. I love your bathroom ❤. I’ve been contemplating painting the vanity in my son’s room and thought about chalk paint. I think I’ll go a different route now. Thanks for sharing ???? Yeah, that’s probably a good idea Lezlie! I also love your bathroom and appreciate all the detail you provide on your site! I am thinking of chalk painting my desk in the office. I used the Rustoleum on a ornate mirror and loved it. I hope the desk will hold up. I wouldn’t want to deal with chipping at anytime. I may look into putting a coat of urethane over the paint. I am thinking of painting the top but then staining over it with gel stain (it will be a different colour than the base). Your problem is likely due to the humidity and water too of course. I wonder if you can just re-do the tops – maybe a different colour (darker) and put a sealer on them (something that is good in humidity). Waiting for the finished product!! Where do you find all your containers for your plants and flowers that you use throughout your decorating? Also, where did you locate your curtains that you have in the bathroom? Thanks for all your great decorating ideas! Look forward to reading each and every post! As for where I find those containers, a lot of them are actually from Hobby Lobby. Usually I can catch a sale and they’re just a few bucks each. Isn’t that weird how chalk paint doesn’t seem to clean up well? That really surprises me. Thanks for the tip on the latex paint and your experience with your kitchen cabinets–good to know!! And good luck sanding and repainting. First, the bathroom makeover is gorgeous. 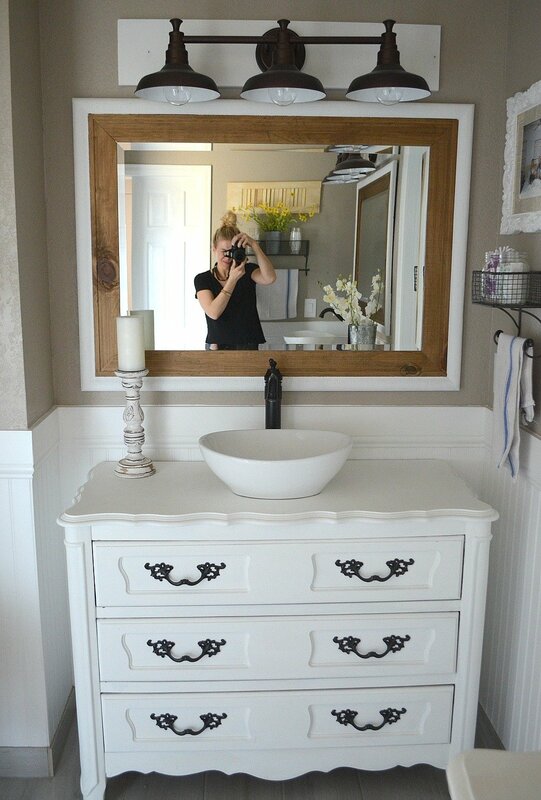 Second, I converted an old dresser into a vanity in my farmhouse bathroom as well. I painted the bottom a creamy white in an oil based paint and I kept the top a natural wood and stained it and then put a sealer on it so the water doesn’t get to it. After a year, it has held up really well. Third, I have been thinking about using chalk paint to redo my kitchen cabinets – they have latex over oil right now and it is a peeling, chipping hot mess. I was thinking of the chalk paint for them because I would only have to do minimal surface prep work but now I’m thinking maybe not? What do you think – would you recommend chalk paint for kitchen cabinets that will get daily use? Hi Laura! I think that probably depends on what kind of look you want on the kitchen cabinets. If you’re looking for a distressed, vintage look I think chalk paint could be great. It will very likely chip and get scuffed up, but if you don’t mind that look then go for it. If not you might want to look into premium latex paint. One other reader just commented about oil based paint chipping and yellowing on her kitchen cabinets, so maybe latex paint is the way to go? 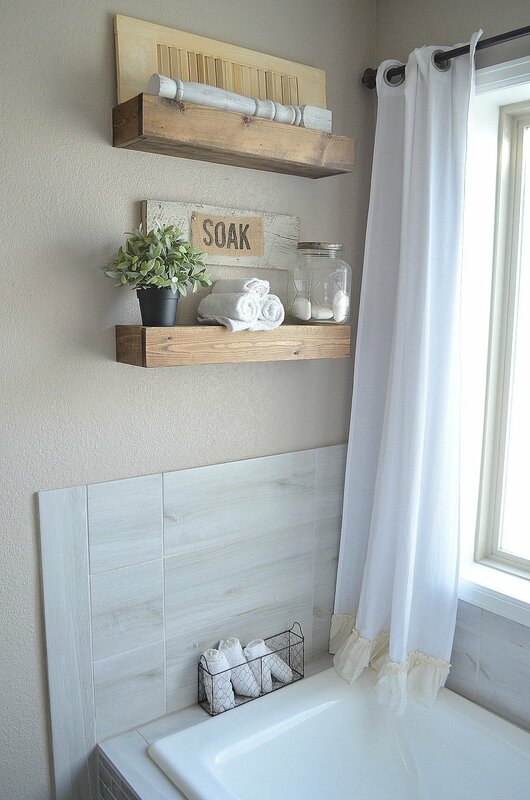 Your bathroom is adorable…I started following your blog because I saw the pictures online on Pinterest I think. I am at the end of a small farmhouse build out, and my tub sits between two vanities. The vanities have cream colored marble tops, and stained cabinets, like a furniture style. I was at a loss as to what to do for tub surround and have decided to do a stained vertical wood, sealed with poly acrylic to match cabinets. For my decking on tub, I am painting with exterior paint the plywood, and faux painting it to match the counter marble…I also cut out decorative wood splashes for the vanities and tub, again using exterior grade paint sealed with poly. I thought if you can paint a house with exterior paint and it stands up to rain, why not on the tub. Time will tell! I will seal with silicone caulking where tub drops into deck. I thought that for yours, maybe have glass or plexiglass, cut from a template for the curves, faucet and bowl might work, or a piece of cultured marble which can be cut to match curves on top. Or try exterior paint next time might help. It’s so cute, and I’m happy to hear the pebble in the shower is loved…I always wondered how that would work. ThAnks for your honest evaluation…it’s helpful. God bless! What a great idea on the exterior paint Faith! I might have to give that a try. And you’re right about the glass on the vanity tops. I hadn’t even though about that actually….thanks for the idea! THANKS FOR YOUR HONEST REVIEW OF YOUR BATHROOM VANITIES. IT MADE MY DECISION ON WHAT TO USE ON MINE MUCH EASIER. Glad I could help Ginger! Thank you so much for posting this review. I have some big projects coming up and I think you just saved me a lot of disappointment. I love your entire bathroom, by the way. 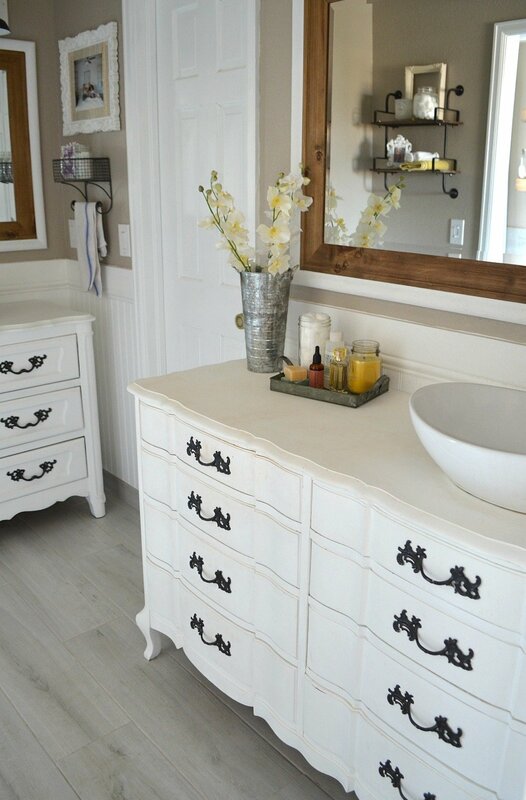 The dressers are just so darn adorable and seem way more functional than standard bathroom vanities. thanks for sharing, love this bathroom! We have the 80s light bar above our vanity right now. I’ve been shopping around for a farmhouse type replacement. It seems most are only 3 or 4 bulbs rather than the 8 we have currently. No windows. Ugh. Have you found the amount of light has decreased dramatically with your replacement? Hi Deanna! Actually no, I haven’t noticed any difference in the amount of light we get. 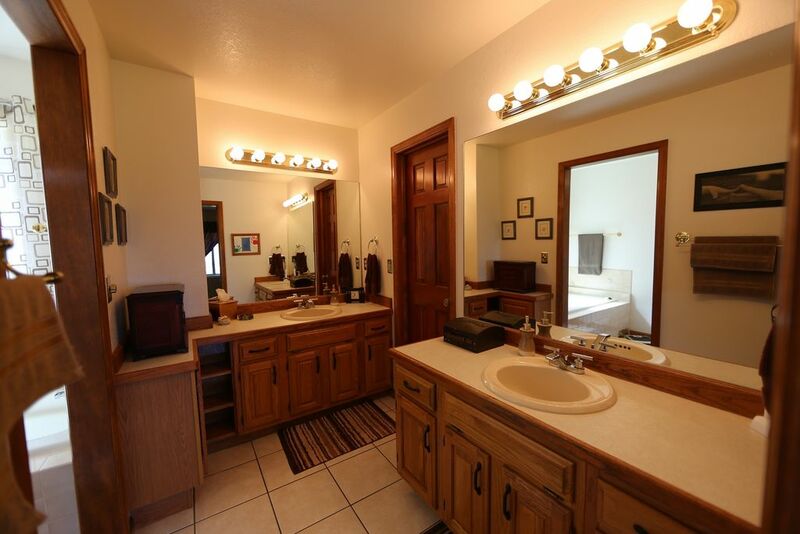 And this bathroom is pretty dark too, so I wanted to make sure we didn’t lose that light with a smaller fixture. I’ve been really happy with these! One more thing–if you remove that old light bar and there’s damage to the wall or the hole is too large for the new fixture you’re putting up, try putting a piece of wood on the wall then attaching the light fixture to that–you’ll need to make a small hole for the wiring to go through of course. That’s what the white piece of wood is behind our lights. We improvised because we didn’t want to fix the hole left by the old light! Thanks for the tip! I would have never guessed that is why you have the piece of wood behind the light. What a great idea! You probably just saved me a lot of time and energy with that advice. Thanks again! Not only do I love your blog but now I love you for your honesty. God bless. 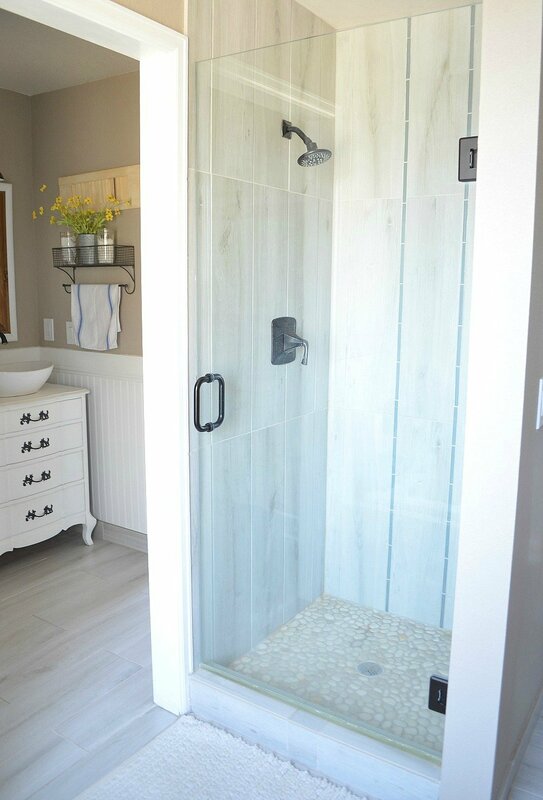 Last spring we did a bathroom redo/refresh. 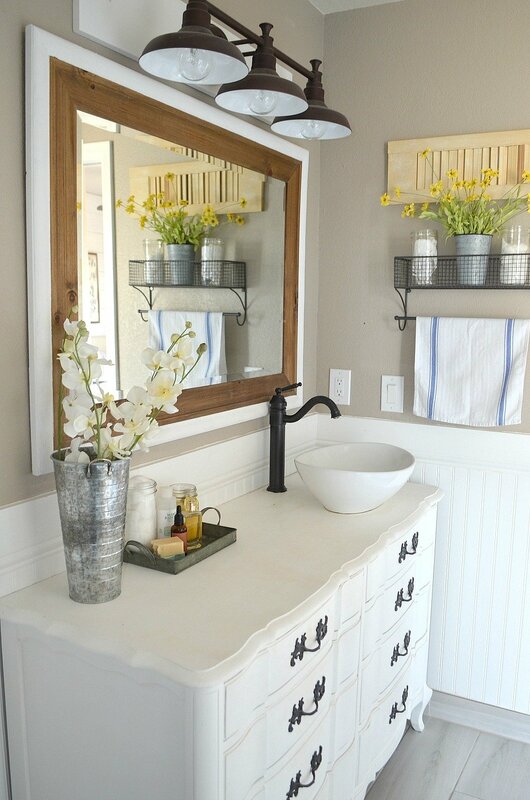 We took out our pedestal sink and repurposed an old farmhouse table into a vanity with vessel sink. I painted it with rustoleum brand chalk paint in country grey and used their matte sealer in 2 coats and waxed as well. I also did the same to the wall of built in cabinetry in that room. It has held up wonderfully! No chips, stains or water damage. I do not use a cleaner on the finish – just wipe down with a damp micro fiber cloth. So I think that adding the 2 coats of sealer might be the additional needed protection for anyone contemplating doing this. I have used the rustoleum brand chalk paint on several projects in many colors along with the matte sealer or polycrylic in matte and have had really great success every time. I am able to buy locally at our Menards store, but I believe they also carry the product on Amazon. Great tip Maria, thanks so much for sharing! I’ve never used the rustoleum chalk paint or their sealer, I will have to check it out. Love your bathroom! Chalk paint with wax is not a good idea to use in a bathroom or somewhere it will be exposed to heat or moisture. It might of been alright if sealed with a water based poly. Such a pain to have to do all over! Yeah, I’m not looking forward to doing it all over again! 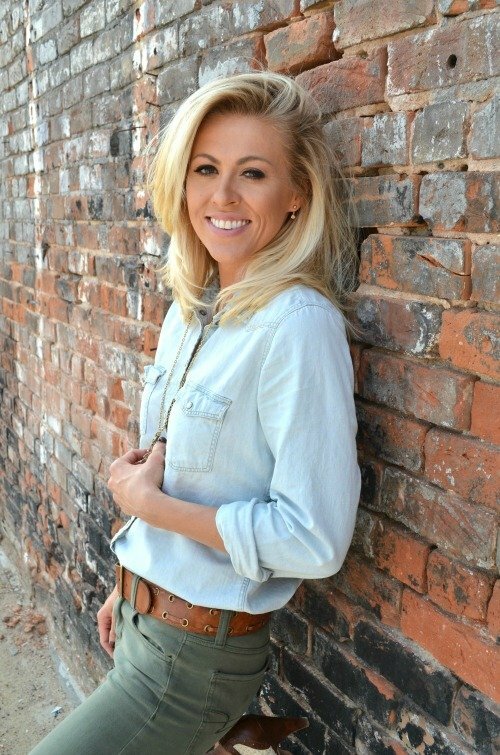 I totally agree with you on chalk paint! I wanted to use chalk paint sooooo bad on our guest bathroom cabinets (because sanding is the worst! ), but I ended up sanding (so.much.sanding.) and painting them with BM Advance. So far they are holding up great and I’m happy with the finish. Chalk paint is so lovely for distressed pieces, but it just doesn’t seem to wear well for high-traffic areas. It’s especially challenging when a water source is involved as you mentioned. Also, I think I started following you right around the time you were finishing this bathroom and I just found it SO inspiring (and still do! it’s gorgeous), because my whole house is very similar to your “before” photo with the 80s vibes and I found hope here! haha! Thanks for your honest review! I hope the refinishing process goes well and isn’t too much work! Aw Ellen, you’ve been around a while then, thank you so much for keeping up that long! And thanks for the tip about the BM Advance. That may be what I use to re-do these vanities. I’m just dreading that process, what a total pain. But I’m really worried about that water damage and need to get it done pronto. Thanks again for the tip and high five for taking on your own fixer upper! 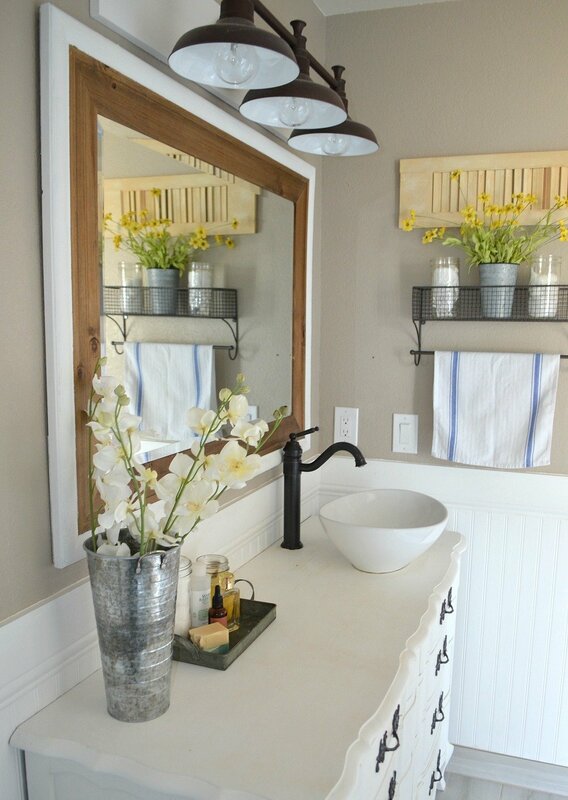 Great information on the chalk paint, still love your bathroom. Thanks so much for your feedback! I love the room, but you’re right. It’s pretty important to have a paint in the bathroom that is a little more water friendly. I considered doing concrete counter tops in one of our bathrooms, but decided against it because I’m scared of the water being an issue. Oh I’ve been tempted by concrete countertops before too, I’ve seen them a few times on Fixer Upper. I think this would have been fine if I had used polycrylic on the whole thing. So not looking forward to redoing it! I did my kitchen cabinets with chalk paint.. I did use a poly over top and they are working out great. done now for about 6 months. You really do have to seal it in the kitchen or bath.. Going to do my bath in a few weeks.. I will let you know how it comes out. I think that’s the key Gail–that annie salon wax just isn’t enough to hold up to daily use and contact with water. Good luck doing your bathroom! I wonder if you could have a piece of glass cut to match the dresser tops, and have holes cut out for the plumbing and sinks. A thick piece of table top glass would hold up to the water and would be almost invisible. Still love the bathroom!! So gorgeous. Someone else actually suggested that same idea Martha. I think it’s so smart! I might actually do that a after I get it repainted, just as an extra precaution to protect the top. Hi! I dont know how you call it but i would recomend using “barniz al agua” or “laca al agua” to protect your vanity insted of wax. The same happened to me on my daughters night table so I gave it an other coat and then protected it with barniz. I’m from Argentina. 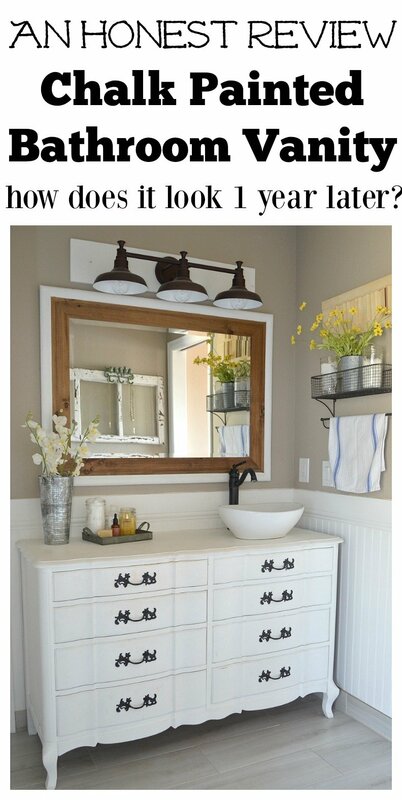 Love you blog and the bathroom makeover is beautiful!!! I am new to your blog and am loving it. 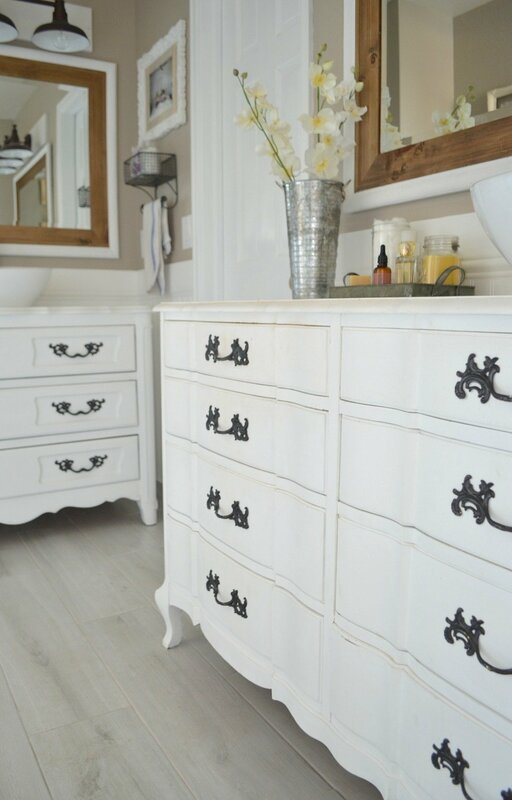 I really love how you have renovated the bathroom using the dressers, but so sorry they have to be refinished so often!. I didn’t read all of the comments, s I’m not sure anyone else had this suggestion. You might stop using wax on areas that are near water or on tabletops. I suggest a polyurethane coating, probably 2 or 3 coats , and I would bet you would not need to redo it for a long time, if ever. This has worked for me several times. You can also get polyurethane that can be used over wax. I dont have the brand I ve used right at hand, but I could find it if you like. Thanks for all your instructive and interesting articles. Hi Lee, thanks for dropping by! I totally agree, I’ve stopped using wax and pretty much only use poly on all of my painting projects of any kind. I just don’t think the wax holds up well to much wear. Even on these vanities, the drawers were so marked up after just a few months. But since redoing them with the poly they haven’t chipped at all! WOW what a gorgeous bathroom! It’s like a dreamy breath of fresh air, thank you for sharing! We have Sherwin Williams premium Pro Classic enamel latex paint on our kitchen cabinets and 3 years later not one issue. Wears beautifully! I’ve also used it on my daughters bedroom furniture and on all of our baseboards as we change out our old 80’s baseboards to taller painted ones and it holds up incredibly well and is self-leveling so no brush strokes show! It’s even amazing painting over oak trim. Thank you for your post. I too LOVE chalk paint and have used it on decorative pieces and contemplated using on my bathroom vanity, but think I will stay with the SW paint option instead. Thanks again! I just did my kitchen cabinets in rustoleum white and they have a matte clear they sale that I put on after. So far doing ok. Please let me know I’ve asked before but I got no response. Thank you very much have a good day ! Hi Jeanine! I did not allow the wax to cure for 20-30 days. We didn’t really have that much time, so it was probably no more than a few days. And about the poly, I haven’t noticed it yellowing at all yet. So far so good. It still looks the same! Such a great post. We are preparing to re-do our main bath. We were wondering about how chalk paint would hold up in the humidity of a bathroom. You answered ALL of my concerns. Thank you so much for you honesty! God bless. The problem with using wax as a sealant in kitchens, bathrooms and outside is the heat and humidity. It softens and melts the wax making it as if you never sealed the paint at all. Outside you use no sealant at all or an outdoor rated poly. Kitchens and baths you should seal with a water based poly. I think you did a great job. U have such a knack. I am thrilled to have your honest input. It’s great and I love it. I painted my bathroom vanity with chalk paint and applied 4 coats of Varathane Soft Touch Poly in Matte almost 2 years ago and they are holding up beautifully. I’ve had no scuffs, scratches, dings or wear thus far (knock on wood) and haven’t had to do any touch ups. It’s also been banged on, scraped while moving other furniture around, makeup spills, hair spray and even a hair dye splatter that all washed off and left no damage. I do believe I got very lucky! During the painting process I added raised stencils in damask on the doors and small damask-like designs in the corners of the drawers with spackle and glazed with a bronze metallic glaze between layers of topcoat. It was a lot of hard work but well worth it because it changed the entire look of the bathroom. I don’t know what I would’ve done if it hadn’t have held up so well – probably torn my hair out! I bet your second refinish lasts for years to come! Hi! I I’m glad I stumbled upon your post! I’m in the prepping stage before I start painting the dresser. Every thing I’ve read has recommended using first a clear shallac, followed by a bonding adhesive primer, then finally an alkyd paint, especially since water will more than likely get on the vanity. The shellac will prevent tannins from bleeding through, which is perfect if using a light shade of paint. Thank you so much for your honesty! 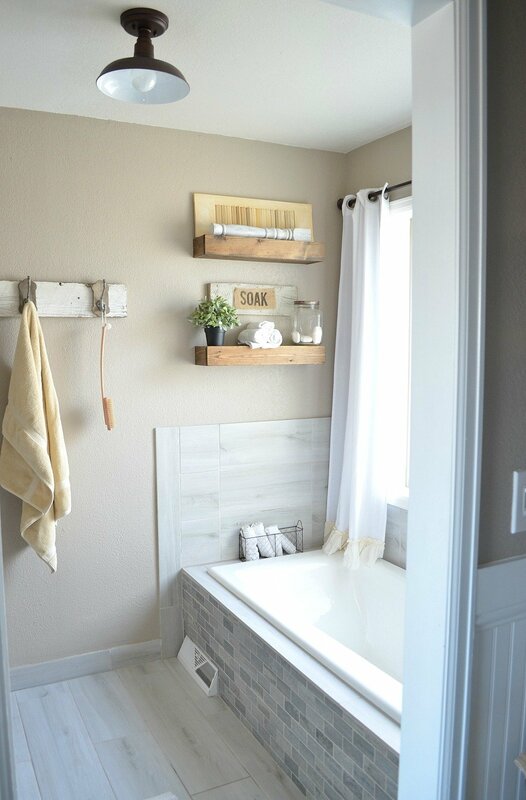 I love chalk paint and was considering using it in our bathroom. I’ll stick with oil based paint now! Hey there, I'm Sarah! Welcome to my blog. I'm tickled pink to have you here. This is my happy place, where I share simple ideas for life + home. Grab your coffee & stay a while, ok?